Flea eggs are whitish and about 0.5 millimeter (mm) (1/32") in length. They are unlikely to be seen without a magnifying glass. 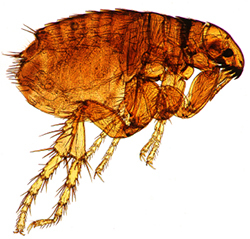 Adult fleas lay eggs after taking a blood meal. The eggs are initially laid on the dog's skin but fall off into the environment to continue their life cycle. 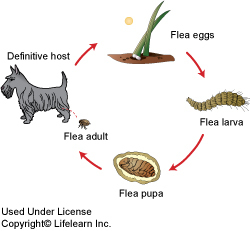 Flea eggs constitute approximately 50% of the total flea population. Eggs may hatch in as little as 14 to 28 days, depending on environmental conditions. High humidity and temperature favor rapid hatching.